Volcanic tuff boulder, City of Rocks, New Mexico. Outhouse at St. Helen Chapel, New Mex. 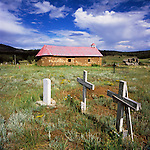 St. Helen Chapel, 1926, cemetery, New Mex. Rustic wooden outhouse, Encino, New Mex.